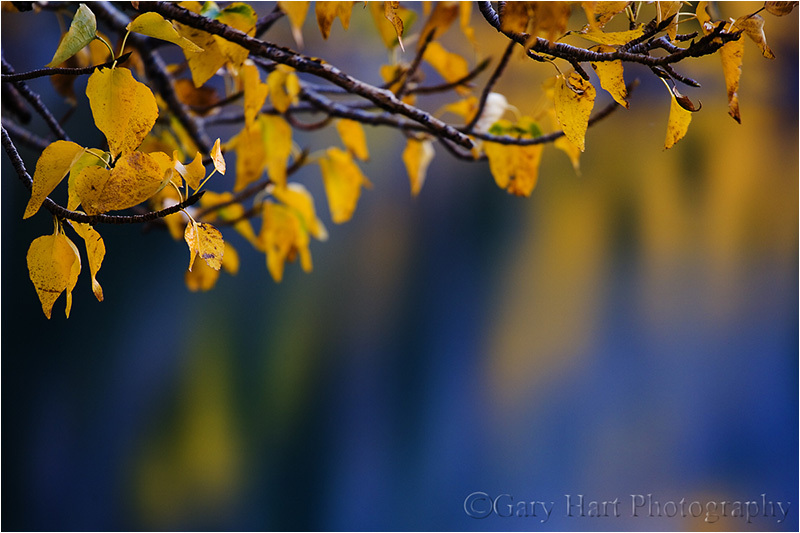 As we enter the fall color photography season, I’m revisiting and revising previous articles. This is the second in the series. 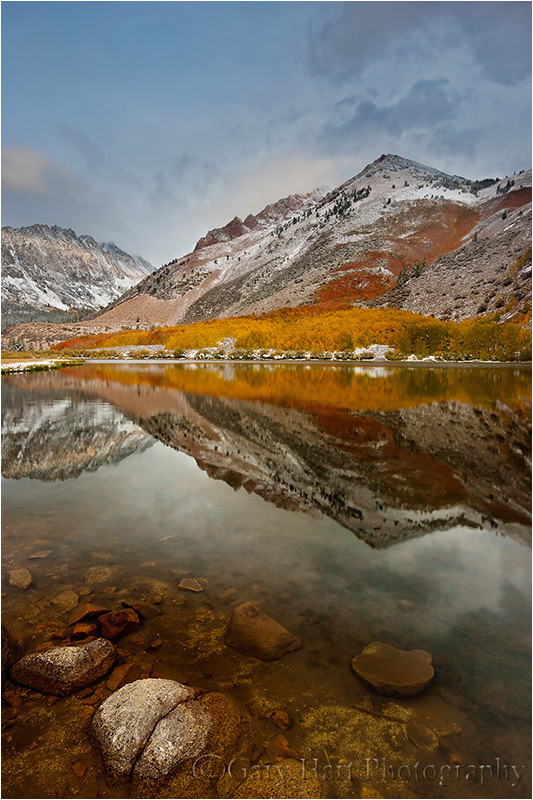 Vivid color and crisp reflections make autumn my favorite season for creative photography. While most landscape scenes require showing up at the right time and hoping for the sun and clouds to cooperate, photographing fall color is often a simple matter of circling the scene until the light’s right. For the photographers who understand this, and know how to control exposure, depth, and motion with their cameras, great fall color images are possible any time of day, in any light. 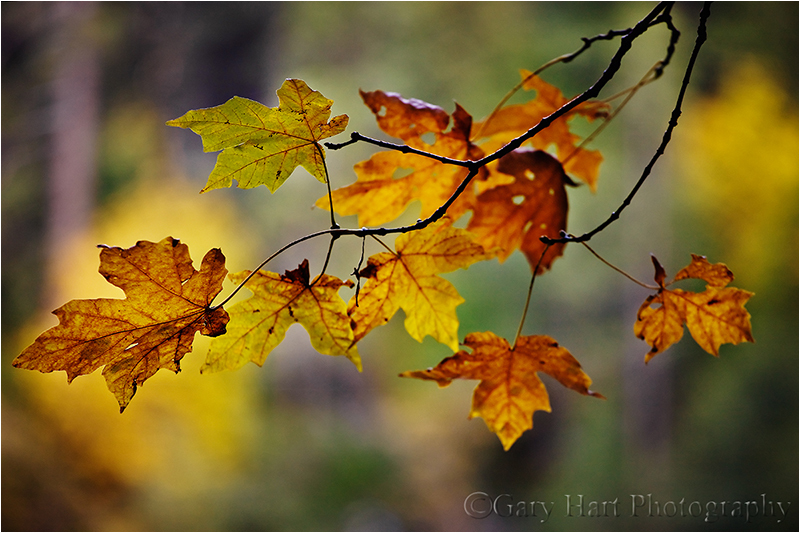 The difference between the front-lit and backlit sides of fall foliage is the difference between dull and vivid color. When illuminated by direct sunlight, the side of a leaf opposite the sun throbs with color, as if it has its own source of illumination, while the same leaf’s lit side appears flat—if you ever find yourself thinking that the fall color seems washed out, check the other side of the tree. While the backlight glow isn’t as pronounced in shade/overcast, when the leaves are illuminated by light that’s spread evenly across the sky, even diffuse sunlight is far more pronounced one side of the leaves than the other, giving the side of a leaf that’s opposite the sky (the side getting less light) a subtle but distinct glow when compared to its skyward side. Big fall color scenes are great, but a telephoto or macro enables you to highlight and emphasize elements and relationships. 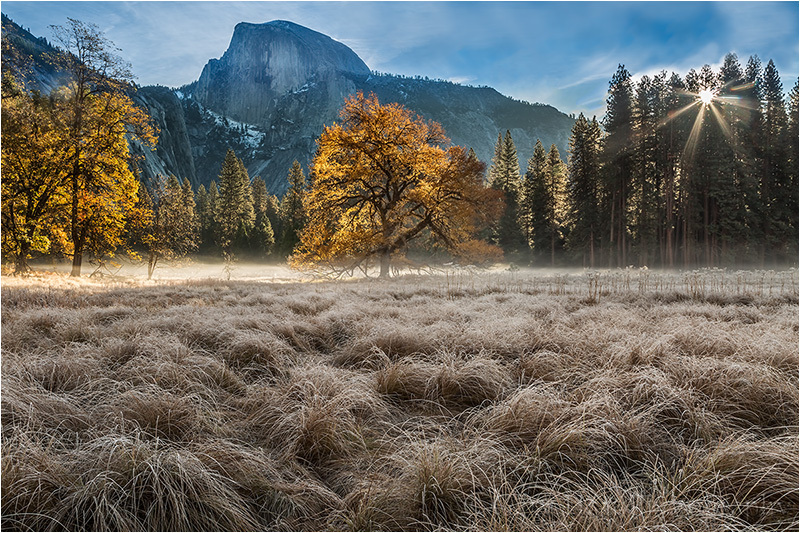 Train your eye to find leaves, groups of leaves, or branches that stand out from the rest of the scene. Zoom close, using the edges of the frame to eliminate distractions and frame subjects. And don’t concentrate so much on your primary subject that you miss complementary background or foreground elements to balance the frame and provide an appealing canvas for your subject. Limiting depth of field with a large aperture on a telephoto lens can soften a potentially distracting background into a complementary canvas of color and shape. 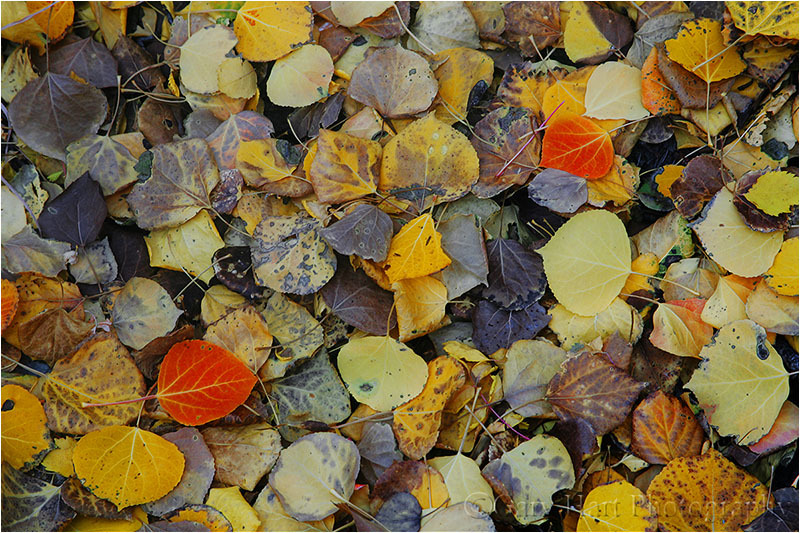 Parallel tree trunks, other colorful leaves, and reflective water make particularly effective soft background subjects. For an extremely soft background, reduce your depth of field further by adding an extension tube to focus closer. 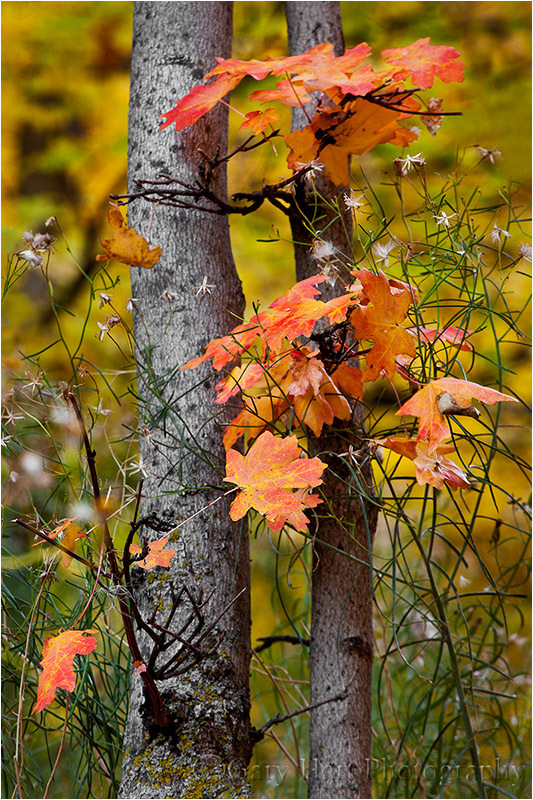 Contrary to what many believe, fall foliage in bright sunlight is still photographable if you isolate backlit leaves against a darker background and slightly underexpose them. The key here is making sure the foliage is the brightest thing in the frame, and to avoid including any sky in the frame. 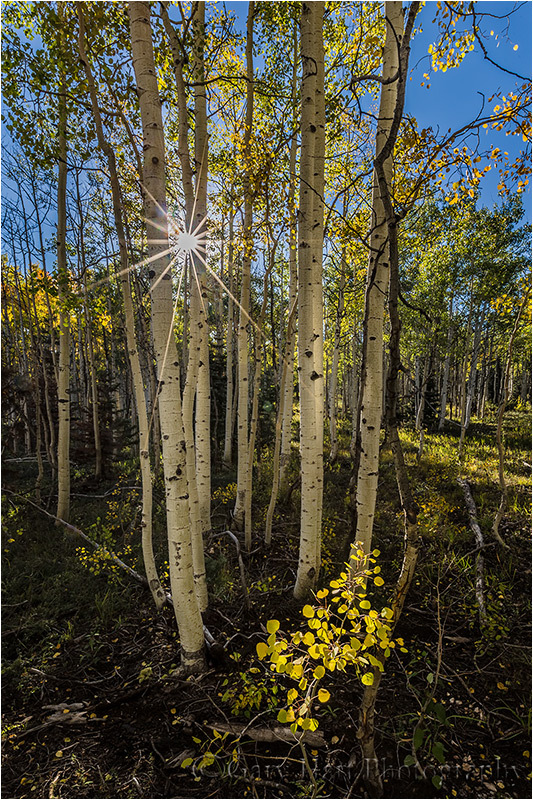 Photographing sunlit leaves, especially with a large aperture to limit DOF, has the added advantage of an extremely fast shutter speed that will freeze wind-blown foliage. Slightly underexposing brightly lit leaves not only emphasizes their color, it turns everything that’s in shade to a dark background. And if your depth of field is narrow enough, points of light sneaking between the leaves and branches to reach your camera will blur to glowing jewels. 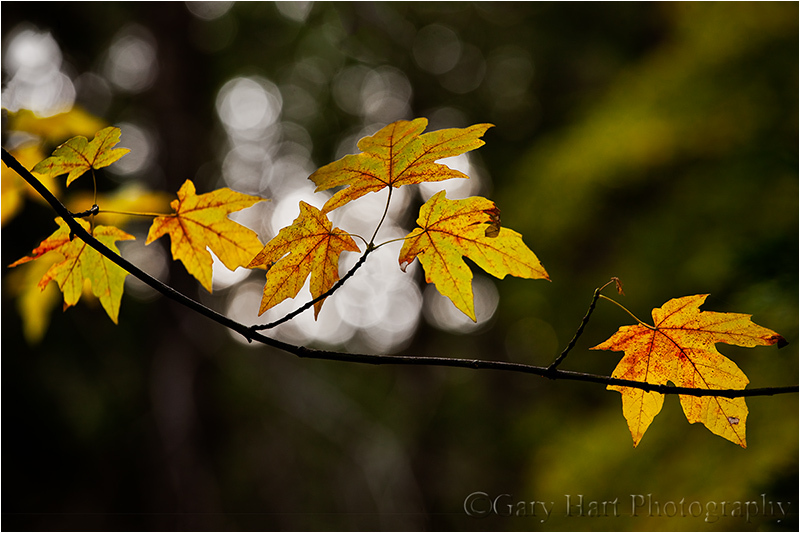 If you’re going to be shooting backlit leaves, you’ll often find yourself fighting the sun. Rather than trying to overcome it, turn the sun into an ally by hiding it behind a tree. A small aperture (f16 or smaller is my general rule) with a small sliver of the sun’s disk visible creates a brilliant sunstar that becomes the focal-point of your scene. Unlike photographing a sunstar on the horizon, hiding the sun behind a terrestrial object like a tree or rock enables you to move with the sun. When you get a composition you like, try several frames, varying the amount of sun visible in each. The smaller the sliver of sun, the more delicate the sunstar; the more sun you include, the more bold the sunstar. You’ll also find that different lenses render sunstars differently, so experiment to see which lenses and apertures work best for you. Fall foliage has a reflective sheen that dulls its natural color. 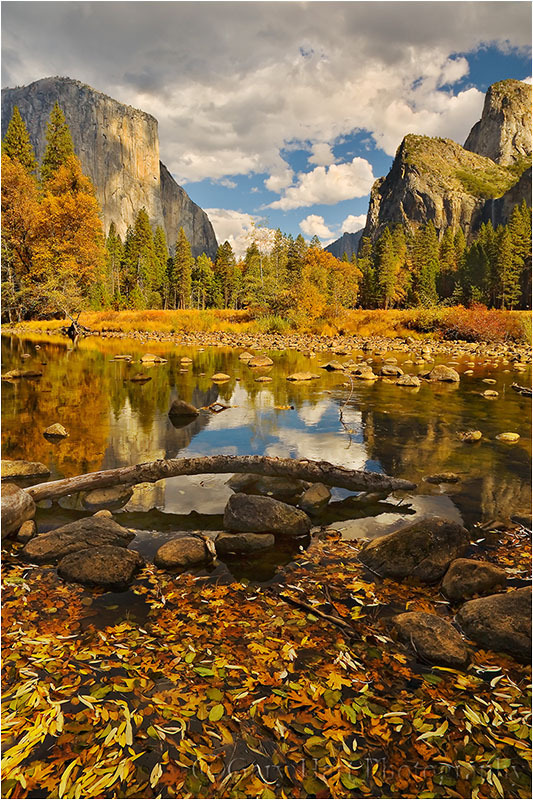 A properly oriented polarizer can erase that sheen and bring the underlying natural color into prominence. To minimize the scene’s reflection, slowly turn the polarizer until the scene is darkest (the more you try this, the easier it will be to see). If you have a hard time seeing the difference, concentrate your gaze on a single leaf, rock, or wet surface. A polarizer isn’t an all-on or all-off proposition. Slowly dial the polarizer’s ring and watch the reflection change until you achieve the effect you desire. This is particularly effective when you want your reflection to share the frame with submerged feature such as rocks, leaves, and grass. When photographing in overcast or shade, it’s virtually impossible to freeze the motion of rapid water at any kind of reasonable ISO. 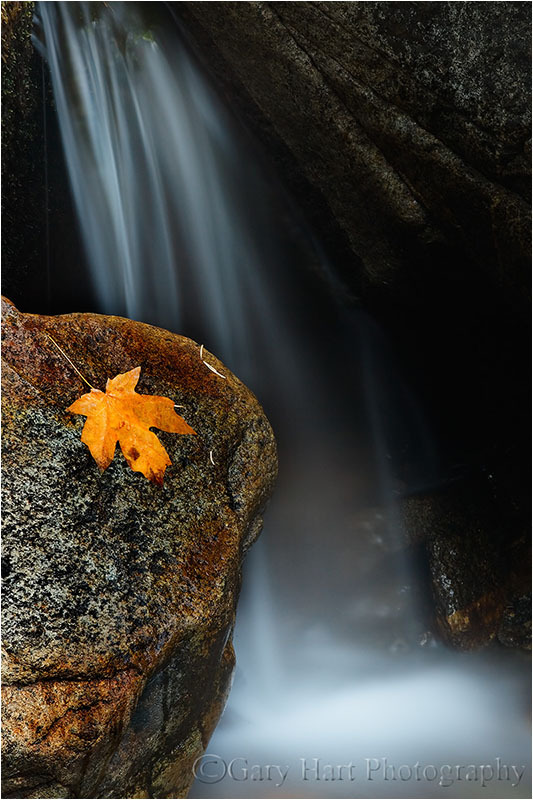 Rather than fight it, use this opportunity to add silky water to your fall color scenes. There’s no magic shutter speed for blurring water—in addition to the shutter speed, the amount of blur will depend on the speed of the water, your distance from the water, your focal length, and your angle of view relative to the water’s motion. When you find a composition you like, don’t stop with one click. Experiment with different shutter speeds by varying the ISO (or aperture as long as you don’t compromise the desired depth of field). By autumn, rivers and streams that rushed over rocks in spring and summer, meander at a leisurely, reflective pace. Adding a reflection to your autumn scene can double the color, and also add a sense of tranquility. The recipe for a reflection is still water, sunlit reflection subjects, and shaded reflective surface. When photographing leaves floating atop a reflection, it’s important to know that the focus point for the reflection is the focus point of the reflective subject, not the reflective surface. This is seems counterintuitive, but try it yourself—focus on the leaves with a wide aperture and watch the reflection go soft. Achieving sharpness in your floating leaves and the reflection requires an extremely small aperture and careful focus point selection. Often the necessary depth of field exceeds the lens’s ability to capture it—in this case, I almost always bias my focus toward the leaves and let the reflection go soft. 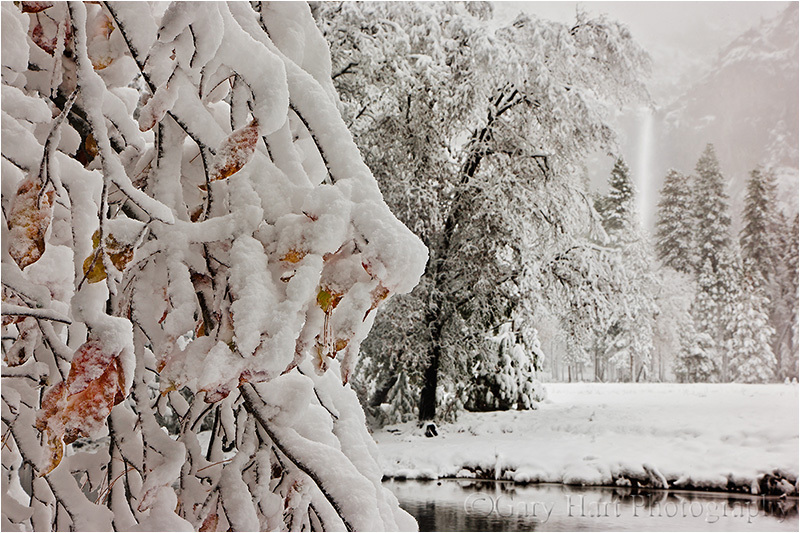 Don’t think the first snow means your fall photography is finished for the year. Hardy autumn leaves often cling to branches, and even retain their color on the ground through the first few storms of winter. 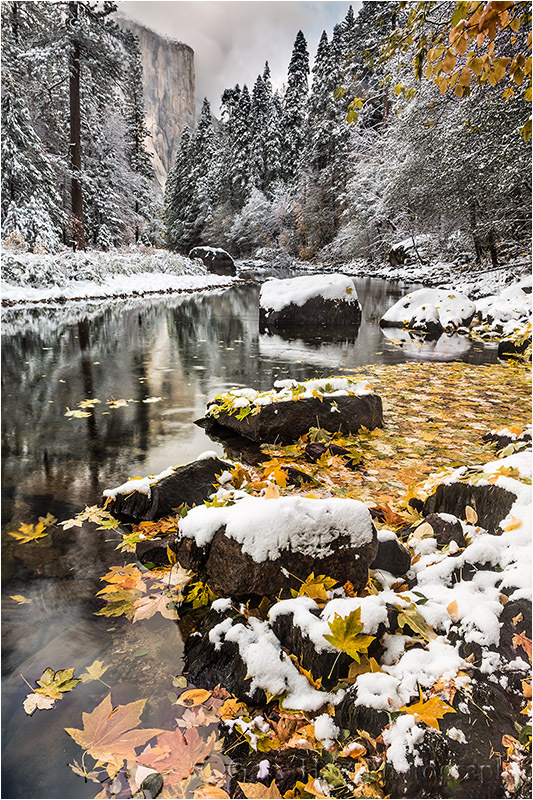 An early snowfall is an opportunity to catch fall leaves etched in white, an opportunity not to be missed. And even after the snow has been falling for a while, it’s possible to find a colorful rogue leaf to accent an otherwise stark winter scene.